Today is Muffin Tin Monday, and the theme is fall, harvest, leaves, etc. I've got leaves, and it almost feels like fall in Dallas, so I'm going with it. After last night's Halloween feast, we're back to nice normal healthy foods, even our treat is homemade (pumpkin chocolate chip bread, it's good). Nana & Dave (my parents, and yes, the kids call my dad Dave, but he's *their* Dave) sent the kids an Edible Arrangement bouquet for Halloween, so we are loving all the fresh fruit--pineapple bats (not used in this tin), cantaloupe, honeydew, strawberries, and grapes. Yum!!! I love the faces on your leaves. What a great tin! The leaf toothpicks are great! And I love that the grandparents sent fruit... awesome idea on their part. How did you get the faces onto the cheese to look so nice? My food writers barely show up. @Java, the faces are bits of cucumber peel, that's why they are so dark. Looks very yummy. I love your site. I am trying to get to the point where I am THIS creative with lunch. I love how your lunches are all good food. Where did you find those leaf picks? I love them! 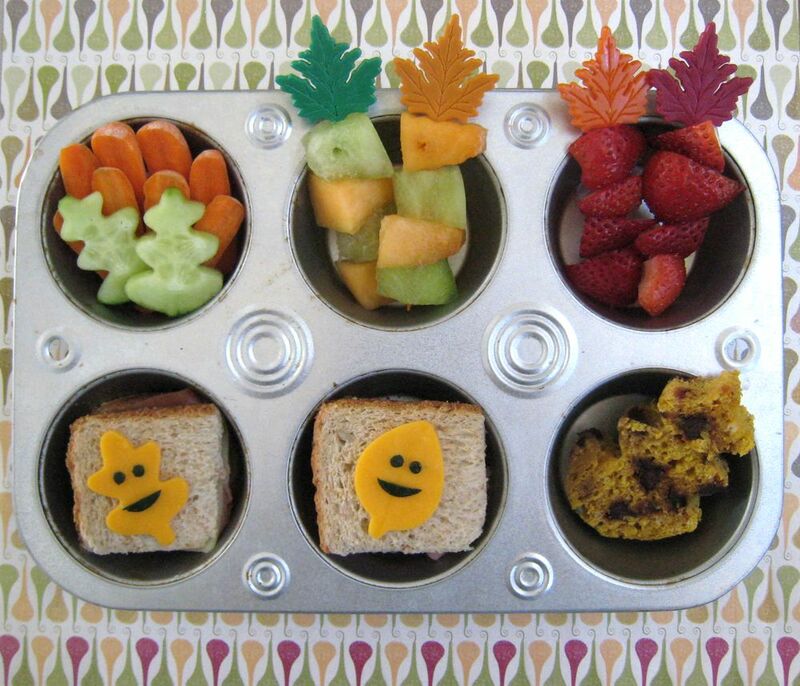 Your leaf cheese is super cute with the faces. I like your meal. The happy faced cheese leaves are adorable! You brought the theme out so well - and as the others said, I love the leaf picks. And great cucumber cutouts - mine always squish when I try. Any secrets? I love that you served fruit & veggies. The faces on the leaves are so cute! Jealous about the fruit basket! I've been trying to use faces more for my son's sammies. Thanks for keeping it foremost in my mind!